A sun-splashed Thursday figures gave way to an overcast and wet Friday, and possibly a very wet and rainy weekend. A light rain was falling as patrons arrived at the course on Friday but the gates opened at their normal 8 a.m. ET time. There’s a chance for thunderstorms in the afternoon. Koepka’s out front at a major. What’s new? A year ago he watched this tournament from the couch, his wrist in a soft cast, too weak to even open a shampoo bottle. 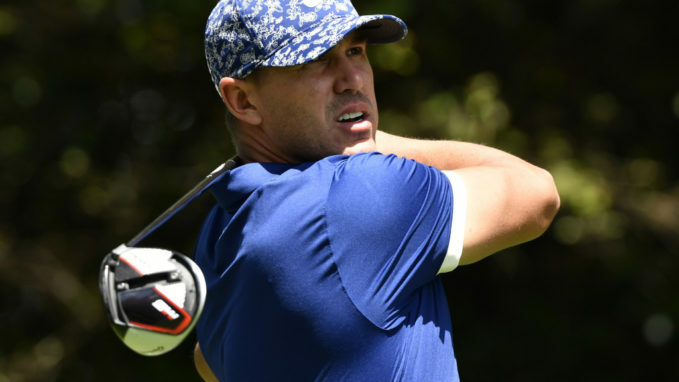 Brooks Koepka waited, healed, then went on a tear. He ripped off wins in the U.S. Open in June and the PGA Championship in August, snared Player of the Year honors and rocketed to world No. 1. 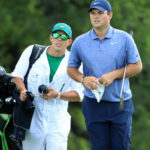 But an illness and 22 dropped pounds left him lurking under the radar ahead of this year’s Masters, despite the glaring fact that he’s won three of the last six majors he’s teed it up in. Adding to the oddity of it: Koepka hasn’t been in the weight room – a staple to his tournament-week routine – since the Players a month ago. And the weight room is kind of his thing. No matter. Thursday was a major championship. Koepka was out front. His 66 is three shots better than any round he’s ever fired on this course, and it put him atop the leaderboard alongside Bryson DeChambeau at 6 under. Remember what Koepka said late last summer, after his triumph at the PGA, after he’d wrapped up three major championships in a span of two summers. What was left to prove? Koepka’s answer hinted at what arrived Thursday. “I need to figure out Augusta,” he said. Bad news for the rest of the field: Through 18 holes, it looks like he has. Augusta National nearly erupted when Bryson DeChambeau’s second at the par-four 18th rolled straight into the cup, smacked the pin and bounced back. He was an inch from a closing eagle. All told his 66 is his lowest round ever in a major, and his best at this course by five shots. Known as golf’s mad scientist – maybe there is something to playing every iron at the same length? 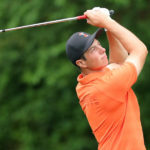 – DeChambeau dazzled on the back nine Thursday, dropping six birdies in his last seven holes to match Koepka at the top of the leaderboard. “What a magical back nine,” DeChambeau said. As for the rest of the week, and the ever-increasing spotlight that will trail him if he stays near the top, DeChambeau offered caution. Start with the man in solo third, who happens to be a three-time winner around here. “That was a lot of fun,” Phil Mickelson said Thursday evening, fresh off a 67, his best opening round in nine years here. Worth noting: The last time he fired a 67 on a Thursday at Augusta National, he wound up winning by three. Behind Mickelson in third, Ian Poulter and Dustin Johnson are sitting just two back, fresh off 68s Thursday. 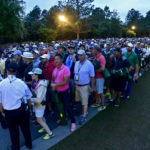 One shot behind them is a group of five that includes 2013 Masters champ Adam Scott, Jon Rahm, Kevin Kisner, Justin Harding and Kiradech Aphibarnrat. All told, six former major champions are currently within four shots of the lead. And one of those major champions happens to be the biggest name in the field. The significance of his opening-round 70 – a score that has him four shots off the lead – was not lost on Tiger Woods Thursday afternoon. One trendy pick entering the week – not to mention the world’s No. 1-ranked golfer – was Justin Rose, who in 13 Masters appearances has never missed the cut. He’ll have his work to do Friday if he wants to keep the streak alive. Rose, who’s finished second twice here, struggled on his way to a three-over 75. “Missed every putt high,” he said. Then there’s Jordan Spieth, who’d been hoping a return to his favorite tournament would lift him from his season-long slump. So much for that. He wound up with the same 3-over 75 that Rose did. It’s two strokes shy of his worst round ever at Augusta. No young golfer loves this place quite like Spieth, the native Texan who nearly won the tournament in his first appearance in 2014, finished the job a year later, nearly did so again in 2016, then tacked on a tie for 11th in 2017 and a solo third last year. 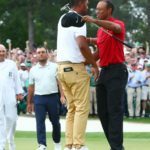 He talked all week about the quiet optimism he has in his game, and despite a listless year, how a fresh shot at Augusta was exactly what he needed. Both Rose and Spieth will have to scrape their way into red numbers on Friday in order to see the weekend.